STAND CO25, TRAFFEX, NEC BIRMINGHAM, 2 APRIL 2019 – Videalert, one of the UK’s leading suppliers of intelligent traffic management and enforcement solutions, has launched a new allelectric Mobile Enforcement Bike on stand CO25 at Traffex. This electric enforcement vehicle will enable councils to enforce a wide range of moving traffic, parking and clean air zone contraventions whilst demonstrating their commitment to reducing emissions. The BMW C Evolution was selected for the launch of this all electric enforcement solution although other brands can be used if required. 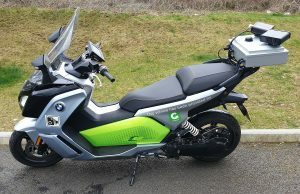 This electro maxi scooter offers a range of up to 160 kilometres with intelligent energy recuperation when braking and accelerating. It is equipped with two dual camera units, one forward and one rear facing, each comprising both an ANPR and a colour camera which captures contextual video evidence. In this configuration, these ONVIF-compliant HD cameras deliver superior capture rates of up to 98% with just a single pass at normal road speeds. This dramatically increases productivity and reduces the total cost of ownership. Used in conjunction with the latest video analytics, the Videalert Mobile Enforcement Bike will deliver the highest productivity at the lowest operating cost in any traffic environment. The on-board systems are totally automatic requiring no manual operation.